Address: 2901 S. Las Vegas Blvd. 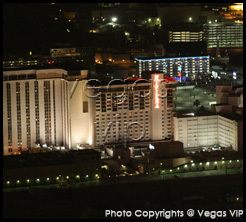 The Riviera Hotel and Casino stakes claim to having a large part in evolving into one of the first Las Vegas hotels in the State of Nevada. Having celebrated its golden anniversary last year, the historic Riviera combines the passion and excitement of nostalgic Las Vegas and the Rat Pack Era and modern day, multi-million dollar remodeling of rooms and convention facilities. 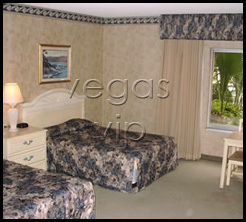 With over 2000 rooms, recently refurbished, offer maximum comfort and great view of the Las Vegas Strip. Each accommodation has been overstuffed and elegantly appointed, including all the important amenities Las Vegas has to offer for both leisure and business travelers. 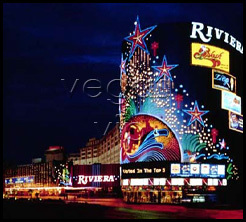 Celebrating 50 years of non-stop entertainment, the Riviera offers four main nightly shows, each one with its own separate Vegas appeal. Splash, Crazy Girls, An Evening at La Cage and the Riviera Comedy Club have each impressed audiences for many years now. Additionally, A Neil Diamond Tribute Starring Jay White draws music fans in droves. Dining is well represented with a wide range of dining rooms, from the seafood and prime steaks at Kristofer's to the Champagne Brunch at the World's Fare Buffet. The Riviera's 100,000-square-foot casino floor continues to be one of Vegas' most active, with gambling options that include the popular Penny Town -- an area full of penny slot machines for the budget-conscious gambler looking for a fun time.